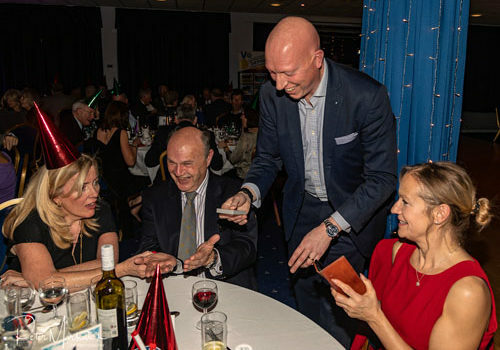 On Saturday 15th December I was booked to entertain with close-up magic at a large Christmas party at Berkshire Masonic Centre, Sindlesham near Reading. 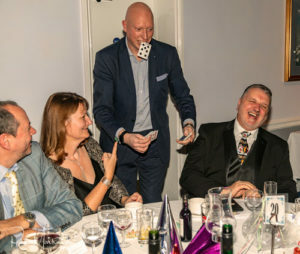 Although part a Christmas party, the event was also to help Berkshire Freemasons raise money (and awareness) towards their big fundraising push for the next five years. Also at the party was Peter Marwick of CFM Photography, who was taking photographs of the event. A while afterwards he forwarded me some fantastic photographs that he took whilst I was entertaining around the tables. There were so many, and some were in a sequence, I put them together into a short video which I think captures the feel of the event. If you want to find out more information regarding Christmas Parties or Masonic Ladies Nights (I entertain at a lot of those too!) please email robert@robertbone.co.uk or complete the quotation request form.